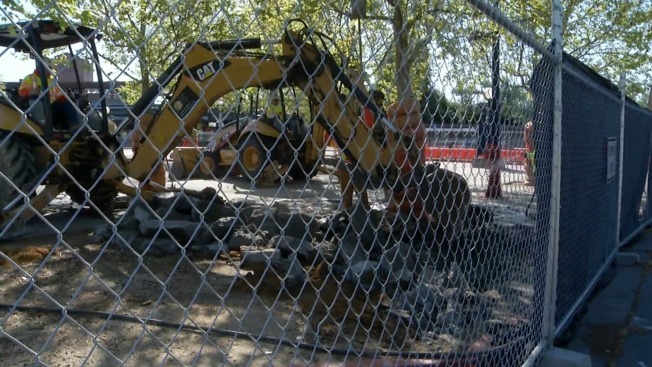 Crews in Concord on Monday will break ground on a multimillion-dollar project designed to link the local BART station with a popular city plaza. Bob Redell reports. Crews in Concord on Monday will break ground on a multimillion-dollar project designed to link the local BART station with a popular city plaza. Roughly three city blocks separate the station and the Todos Santos Plaza, which is known for hosting community festivals and music in the park, but the two locations will soon be linked together via a pedestrian pathway, which will feature a raised sidewalk, bike lane and revamped landscaping, according to officials. "We're doing a lot of things with our corridors," city councilman Ron Leone said. "We're lighting them up. We're adding stuff to the pavement. We're attracting new apartments. We're getting new businesses. We've got four new restaurants downtown now. There's a lot of vibrancy that's going on." The pedestrian walkway will not replace the entire stretch of pavement along Grant Street currently connecting the station and the plaza. It will simply connect the BART station with the corner of Oak and Grant Streets. The $6.5 million project, which is funded by Proposition 1B, Measure J and BART funds, is expected to be completed by summer of 2018, according to officials. Groundbreaking for the project began Monday morning.